The anaphase promoting complex is a highly conserved E3 ligase complex that mediates the destruction of key regulatory proteins during both mitotic and meiotic divisions. In order to maintain ploidy, this destruction must occur after the regulatory proteins have executed their function. Thus, the regulation of APC/C activity itself is critical for maintaining ploidy during all types of cell divisions. During mitotic cell division, two conserved activator proteins called Cdc20 and Cdh1 are required for both APC/C activation and substrate selection. However, significantly less is known about how these proteins regulate APC/C activity during the specialized meiotic nuclear divisions. In addition, both budding yeast and flies utilize a third meiosis-specific activator. In Saccharomyces cerevisiae, this meiosis-specific activator is called Ama1. This review summarizes our knowledge of how Cdc20 and Ama1 coordinate APC/C activity to regulate the meiotic nuclear divisions in yeast. The proper segregation of chromosomes at meiosis I and II is essential for producing gametes with the correct haploid genome (Figure 1). 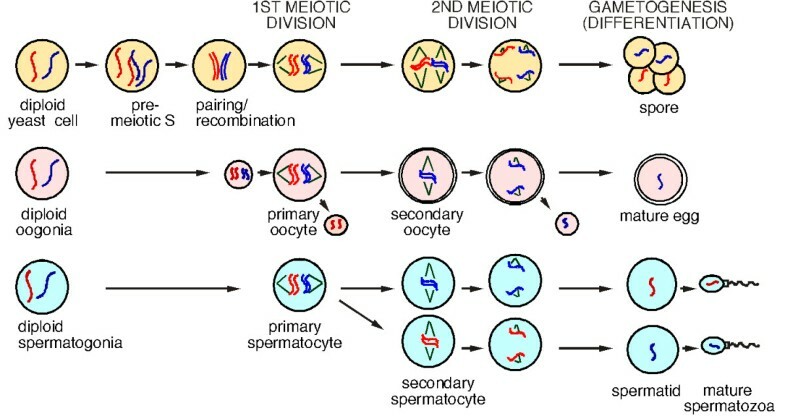 During oogenesis, meiotic progression is arrested at the first or second division during development. Maturation of the oocytes or fertilization is required to relieve these blocks, respectively. Spermatogenesis is a continuous process that occurs throughout most of the life of the male. Yeast sporulation possesses the hallmarks of mammalian meiosis and is similar to spermatogenesis in that the process does not exhibit programmed arrest points. In Saccharomyces cerevisiae, entry into the meiotic program is dependent upon cell-type and environmental clues . Following induction, premeiotic DNA replication occurs followed by a lengthy prophase in which homologous chromosomes synapse and undergo a high level of genetic recombination prior to meiosis I ( & Figure 1). This genetic exchange is essential for chromosomes to correctly align at metaphase I. It is during meiosis I, the reductional division, that the sister chromatids remain paired, attach to only one spindle, and segregate together. This centromeric cohesion is lost during the second meiotic division, which resembles mitosis, where the replicated sisters make bipolar attachments and separate to opposite poles . The resulting four haploid nuclei are each encased in a multi-layered structure called a spore that remains dormant until induced to reenter mitotic cell division by growth signals . Thus, the monopolar attachment of replicated sister chromatids at meiosis I and the execution of two nuclear divisions without an intervening S phase represent two major differences between meiotic and mitotic divisions. Meiotic divisions are conserved between yeast and higher eukaryotes including mammals. Cartoon showing the similarities between the meiotic divisions in yeast and mammals. The red and the blue lines represent chromosomes. Pre-meiotic S, pairing and recombination occur in oogenesis and spermatogenesis but have only been drawn for meiosis in yeast for clarity. The basic cell cycle machinery driving mitotic cell division (e.g., DNA polymerases, cyclin dependent kinases, ubiquitin ligases) is also required to execute meiosis. However, meiosis presents several challenges that are not found during mitosis such as maintaining sister chromatid attachment during the reductional division or undergoing two nuclear divisions without an intervening S phase. Studies in S. cerevisiae have identified two strategies by which the mitotic cell cycle machinery is redirected to execute the meiotic divisions. The first method involves replacing mitotic regulatory proteins with meiotic counterparts. For example, Rec8 replaces Mcd1 to maintain sister centromere cohesion during meiosis I . In addition, Ama1 is a meiosis-specific activator of the anaphase promoting complex/cyclosome (APC/C) ubiquitin ligase and is required for exit from meiosis II [5–8]. The second approach utilizes mitotic regulators that take on new meiotic functions. For example, the mitotic S-phase cyclins Clb5 and Clb6 are required for the initiation of recombination and synaptoneal complex formation during meiosis . Furthermore, the APC/CCdc20 ubiquitin ligase that controls the G2/M transition in mitotic cells also has a meiosis-specific role to induce early meiotic gene transcription as well as progression through prophase I [8, 10, 11]. The focus of this review is to summarize our knowledge of how the APC/C regulates, and how it is regulated by, the meiotic differentiation program in the model system S. cerevisiae. To examine the regulation and activity of APC/CCdc20 during meiosis, it is helpful to first start with what is known about this ligase's function and regulation during mitotic cell division. The APC/C is a multi-subunit ubiquitin ligase that directs the destruction of cell cycle regulatory proteins at the metaphase-anaphase transition, exit from mitosis, and G1 . The control of APC/C activity and specificity is complex (for reviews see [13–16]). During mitotic cell division, APC/C activation depends on its sequential association with two evolutionarily conserved coactivators, Cdc20 and Cdh1 (Figure 2). In brief, in the presence of high cyclin dependent kinase (Cdk) activity, Cdc20 activated APC/C (APC/CCdc20) promotes the metaphase-anaphase transition by directing the destruction of the anaphase inhibitor Pds1/securin [17–20] causing subsequent dissolution of the cohesin complex holding the sister chromatids together (see  and references therein). After anaphase, APC/CCdh1 mediates the final degradation of mitotic B-type cyclins and several other proteins [22–27] as the cell exits mitosis and enters G1. In S phase and G2, the APC/C is inactive to allow accumulation of proteins required for building the mitotic spindle. Regulation of the G2/M transition and mitotic exit by the APC/C. Destruction of Pds1 (securin) by APC/CCdc20 triggers the metaphase-anaphase transition. Checkpoint pathways monitoring spindle attachment or DNA damage can inhibit APC/CCdc20 activity by direct association of spindle assembly checkpoint (SAC) components or phosphorylation by PKA. The exit from mitosis initially requires the degradation of several regulatory proteins including the B-type cyclin Clb2 by APC/CCdc20. Final mitotic exit requires APC/CCdh1 which continues Clb2 degradation to completion. APC/CCdh1 remains active in G1 partially destroying Cdc20. The decision to enter meiosis occurs early in G1 and requires APC/CCdc20 destruction of Ume6. Inhibition of Cdc20 function by PKA phosphorylation drives the cell through G1 to reinitiate another round of mitotic cell division. APC/C mediated proteolysis of key regulatory proteins drives the cell from G2 through M phase into G1. Accordingly, the APC/C is under a strict temporal control so these targets are destroyed in the correct order. Toward this end, APC/CCdc20 is regulated by at least four mechanisms. First, Cdc20 levels are modulated by transient transcription from S phase through G2 phase and proteolysis in G1 [28, 29]. Once associated, APC/CCdc20 is inhibited in G2 by Mad2p, a component of the spindle assembly checkpoint (SAC) pathway [30–32] (Figure 2). In addition, activation of the DNA damage checkpoint pathway inhibits Cdc20 activity by direct phosphorylation by Protein Kinase A (PKA) . Achieving bi-polar attachment of chromosomes on the metaphase plate extinguishes the spindle checkpoint signal permitting securin (Pds1) ubiquitylation/destruction and anaphase to proceed . A unified molecular model of how checkpoint proteins block APC-mediated ubiquitylation of securin has not been established. Recently, Mad3 has emerged as a key player in this process that both mediates Cdc20 degradation in prometaphase by an unknown mechanism [35–37] and acts as an APC/C pseudo-substrate inhibitor . In G1, APC/CCdh1 and a proteasome independent mechanism induce Cdc20 proteolysis as the cells prepare for the initiation of DNA replication . In addition to proteolysis, Cdc20 is again negatively regulated by PKA but at a different site to prevent the initiation of meiosis (see below). To enter the meiotic program, cells exit the cell cycle early in G1 before the accumulation of the G1 cyclins . The transition between mitotic and meiotic cell division requires the destruction of the transcriptional repressor Ume6 by APC/CCdc20 . Ume6 is a C6 zinc cluster DNA binding protein  that represses early meiotic genes during mitotic cell division in the presence of nitrogen and a fermentable carbon source (Figure 3, left panel). Under rich growth conditions, activated PKA phosphorylation of Cdc20 (at a site different than targeted following DNA damage) restricts APC/C activity, possibly by preventing the interaction of Cdc20 with some of its substrates [33, 41]. This model is consistent with the observation that Cdc20 and Ume6 do not associate under rich growth conditions . Ume6 destruction has been divided into a two-step process. The first step partially degrades Ume6 and occurs in cultures growing in medium containing nitrogen and only a non-fermentable carbon source (Figure 3, middle panel). In this medium, PKA activity is reduced along with the inhibitory phosphorylation on Cdc20. This reduction in Ume6 levels results in a low level derepression of early meiotic genes. 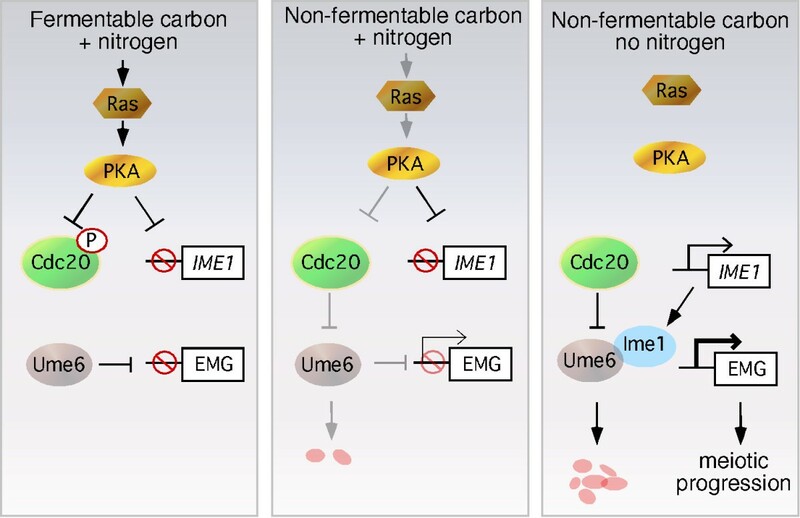 However, Ume6 destruction is not complete until cells are shifted to media lacking both nitrogen and a fermentable carbon source (Figure 3, right panel). Under these conditions, the IME1 gene is transcribed and the association of its gene product with Ume6 completes APC/CCdc20 dependent destruction . Once Ume6 destruction is complete, EMG transcription is induced and meiotic program is initiated. The mechanism for how Ime1 association mediates the final destruction of Ume6 is not known. However the presence of Ime1 stimulates Ume6 ubiquitylation by APC/CCdc20 in vitro (unpublished results). These findings suggest a model that APC/CCdc20 is re-tasked by the presence of Ime1 to complete Ume6 destruction. Recent studies indicate that APC/C regulation of post-mitotic differentiation programs may be more common than previously appreciated (reviewed in ). For example, the oncoprotein Sno, a negative regulator of the SMAD pathway, is destroyed in an APC/C dependent manner following TGFβ stimulation . In addition, a post-mitotic role for the APC/C has been observed in neurons [43, 44]. Finally, in a system perhaps analogous to APC/CCdc20 and Ume6, destruction of the transcriptional repressor Id2 by APC/CCdh1 is required for exit from the mitotic cell cycle and to restrain axonal growth in neurons . Therefore, the introduction of a developmentally regulated protein such as Ime1 may provide a mechanism by which the substrate spectrum of the APC/C can be altered in the context of a differentiation program. APC/C Cdc20 mediated destruction of Ume6 is required for meiotic entry. Under rich growing conditions, PKA phosphorylation inhibits Cdc20 activity both protecting destruction of Ume6 is required for meiotic entry and preventing transcription of the meiotic inducer IME1 (left panel). 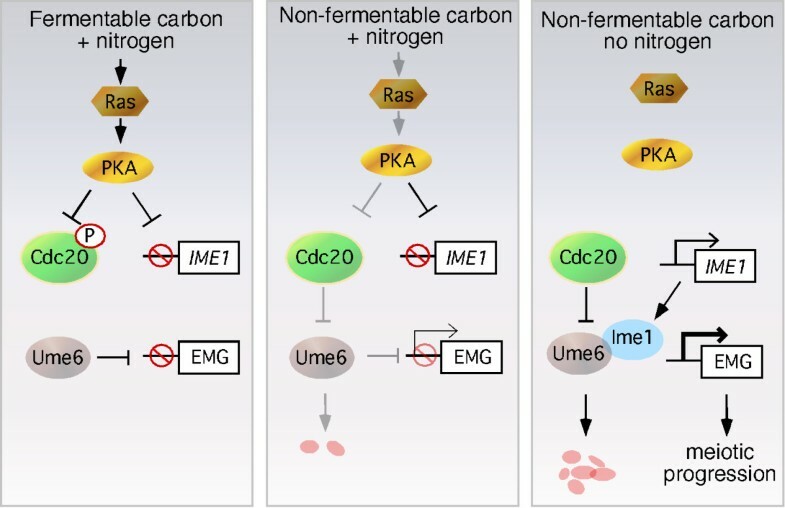 Switching cultures to medium lacking a fermentable carbon source but containing nitrogen reduces PKA activity which permits partial Ume6 destruction (middle panel). Removing nitrogen allows Ime1 production which, along with fully active Cdc20, completely destroys Ume6 allowing early meiotic gene (EMG) induction and meiotic progression (right panel). Evidence from many groups indicate that APC/CCdc20 triggers Pds1/Securin destruction prior to each nuclear division (Figure 4). For example, temperature sensitive cdc20 mutants arrest at prophase I when cells are shifted to the restrictive temperature after meiotic entry [8, 11]. In addition, wild-type cells expressing a non-destructible allele of PDS1 also arrest at prophase I [46–48]. Lastly, single cell immunofluorescence studies revealed Pds1 proteolysis prior to both meiotic divisions . Surprisingly, APC/CAma1 also has the capability to destroy Pds1 during the meiotic divisions [47, 49]. However, this destruction only occurs in cells lacking the APC/C inhibitor Mnd2 [5, 47, 49]. Regulation of meiotic progression by the APC/C. Diagram showing the known (red) and potential (purple) execution points for APC/CCdc20 and APC/CAma1 activity during meiosis. The role for APC/CCdc20 in both nuclear divisions imply that its activity must oscillate during this stage in development. Specifically, APC/CCdc20 must be inactive to permit Pds1 accumulation at metaphase I, activated to destroy it at anaphase I, then toggle off and on again to allow the second division to occur (Figure 5). CDC20 expression is under the control of the NDT80 transcription factor and its mRNA is present during both meiotic divisions [8, 50]. Using the presence or absence of an indirect immunofluorescence signal, Cdc20 levels were reported to dramatically fall between anaphase I and metaphase II  suggesting that protein destruction represented a key regulatory strategy. A potential clue for how Cdc20 levels are modulated came from the finding that Cdc20 is destroyed by APC/CAma1 as cell exit meiosis II . This result was different than G1 mitotic cells which utilize a combination of APC/C dependent and independent mechanisms to accomplish this task. Interestingly, Mnd2-dependent inhibition of APC/CAma1 is mitigated prior to anaphase I, consistent with a role in Cdc20 degradation prior to metaphase II (Figure 4). However, it is not clear how APC/CAma1 activity (Figure 5) would then be inhibited to allow subsequent accumulation of Cdc20 necessary for execution of the second division. In S. pombe, as well as higher eukaryotes, the APC/C is inhibited at the MI/MII transition by specific endogenous inhibitors (reviewed in ). Therefore, one possibility is that a meiosis-specific inhibitor is synthesized to transiently curtail APC/CAma1 activity. Interestingly, cells deleted for cdh1 fail to induce Cdc20 during meiosis yet display similar execution kinetics and spore viability as wild type . This suggests a model in which Cdh1 is indirectly required to keep Ama1 inactive until cells reach anaphase I exit. Regulation of Ama1 and Cdc20 activity during meiosis. The upper graph depicts the relationship between APC/CAma1 activity and Ama1 protein accumulation during meiosis. In addition, Clb/Cdk1 activity is presented. The bottom graph illustrates the relationship between APC/CCdc20 activity and Cdc20 protein accumulation during meiosis. Upon exit from the second meiotic division, APC/CAma1 mediates Cdc20 destruction through two degrons, a destruction box and a GxEN element . In S. cerevisiae, Cdc20 destruction is not essential for meiotic progression as introducing a stabilized allele of CDC20, under the control of the Ama1 promotor, did not affect spore production or viability . This result suggests that APC/CCdc20 can be inactivated by alternative mechanisms. For example, dephosphorylation of core APC/C subunits, possibly by PP1 or PP2A phosphatases, decreases APC/C activity (reviewed in ). In support of this idea, dephosphorylation of Cdc20 is important for release from metaphase II arrest in Xenopus egg extracts [52, 53]. APC/C inactivation at the end meiosis is also critical for embryonic development in Drosophila . Here, the meiosis-specific APC/C activator CORT (also known as CORTEX, ) is destroyed by APC/CFZY (Cdc20p homologue) by completion of meiosis in the early embryo. Moreover, this degradation is destruction box dependent and hypothesized to be important for embryogenesis . Finally, one interesting mechanistic question is how Cdc20 switches from being an activator to a substrate of the APC/C. Extensive studies have been devoted to a molecular understanding of APC/C substrate and activator recognition in mitotically dividing cells (reviewed in [56–58]). It is known that the conserved APC/C binding motifs (called C-box and IR motif) are required for APC/C binding of Cdc20, Cdh1 and Ama1 [8, 59, 60]. Cdc20 binding to the APC/C via these motifs is not required for its destruction . This suggests a model in which once Cdc20 is dissociated from the core APC/C, it is targeted for degradation by APC/CAma1. It is clear that regulatory system governing meiotic development borrowed heavily from the system controlling mitotic cell division. For example, targeted ubiquitin mediated proteolysis of key regulatory factors still pushes meiosis and mitosis in one direction. In addition, these destruction pathways are governed by checkpoint surveillance systems to ensure the execution of one event before proceeding to the next. However, unique characteristics associated with meiosis such as haploidization, and the fact that meiosis is not a cycle but a linear differentiation pathway, necessitated significant modification of the mitotic regulatory pathways. At the onset, APC/CCdc20-dependent destruction of Ume6 sits at the decision point between meiosis and mitosis. Destroying Ume6 induces a specialized set of genes able to induce meiS phase under conditions (absence of nitrogen and other nutrients) that would prohibit mitotic S phase. Next, the ability to execute two nuclear divisions without an intervening S phase requires delicate fine tuning of APC/CCdc20 activity to permit reassembly of the meiosis II spindle without allowing formation of the pre-replication complex on DNA replication origins. 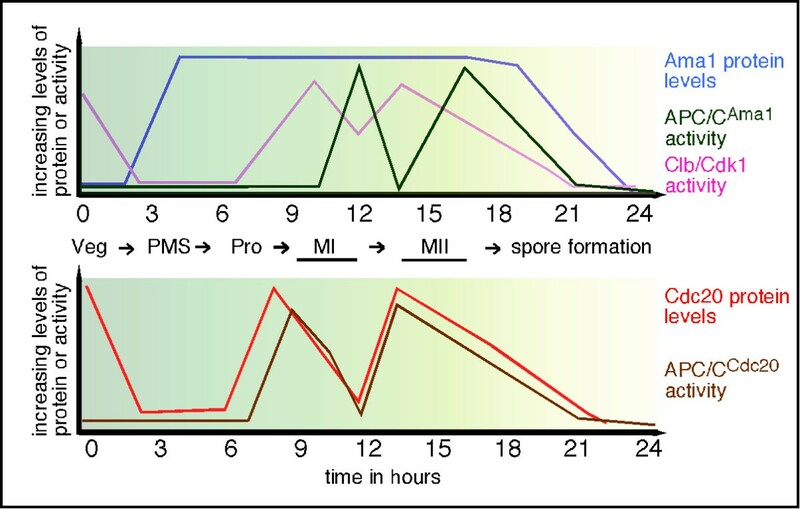 Finally, as post-meiotic cells can be dormant for extended time periods, the destruction of all three APC/C activators protects against precocious re-entry into the mitotic cell cycle. This work was supported by ACS grant CCG106162 to K.F.C. and the National Institutes of Health grants CA90097 and GM57842 to R.S. KFC and RS wrote the manuscript together. Both authors read and approved the final manuscript.